Throughout the season, we will offer various Mixed-Level Open Plays. These Open Plays are a fun opportunity allow players from different levels to meet, play together and have fun! Specific locations are listed for each event. Generally, “Yellow” and “Blue” Open Plays will occur around the first week of the month. Registration will open on this page each preceding Friday at 12:00 noon. Once registration opens, a section will appear below that allows you to provide some information, along with a PayPal “Buy Now” button. – TWO CHOICES: April 8th and 10th! 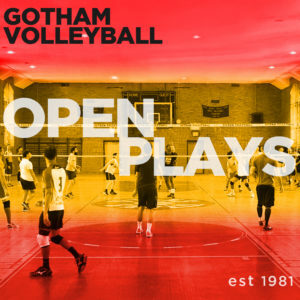 You may choose ONE, and waitlist for another by going to www.gothamvolleyball.org/open-play-waitlist/. Note: Locations subject to change depending on facility availability. • Players in the same Division Play team will be assigned to the same Open Play team whenever possible. The Open Play team kindly requests that you refrain from emailing in to make this request. – NEW NIGHT ADDED: April 8th! • Players in the same Division Play team will be assigned to the same Open Play team whenever possible. Please do not email OpenPlay to make this request.